Strawberry in perfume. Sounds scary, doesn’t it? Strawberry is a note so familiar from jam, yogurt, and Bonne Bell Lip Smackers that it seems like it would instantly deep-six a fragrance. Strawberry carries a lot of baggage. Imaginary Authors Cape Heartache and Dawn Spencer Hurwitz Amouse Bouche feature strawberries in ways that are fresh and interesting. For me, neither fragrance makes me hungry for shortcake and Cool Whip, and they both lend a new appreciation for strawberry — in completely different ways. My broken heart would probably smell like old wine bottles and unwashed hair, but fortunately Josh Meyer, the nose behind Imaginary Authors, envisioned a mountain man’s heartache, complete with incense cedar’s mysterious ability to smell slightly funky, yet spiritual. A hint of vanilla and what in my mind are tiny, misshapen but sweet wild strawberries soften the resins’ piney edge so that Cape Heartache doesn’t lean toward turpentine, as some resinous fragrances can. The strawberries are easy to pick out, but they never turn sticky or jammy. Cape Heartache is fairly linear and lasts a good eight on hours on me, although it does quiet down after the first hour or so. It was the perfect fragrance to wear while I decorated the Christmas tree. Amouse Bouche takes strawberry somewhere else completely. 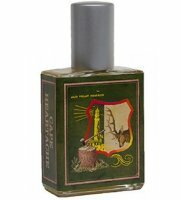 Amouse Bouche (Hurwitz deliberately chose this creative spelling of “amuse bouche” because she liked the visual symmetry of “ou” in both words) includes notes of strawberry aldehyde, floral heart, rich wood, and buttery brioche. It comes in both Extrait and Eau de Parfum. My sample is Eau de Parfum. Hurwitz describes Amouse Bouche as a “succulent strawberry gourmand perfume layered within an aldehydic floriental design.” It’s part of a series of fragrances she created to complement the Denver Art Museum’s Passport to Paris exhibit featuring French art from the late 1600s to the early 1900s. Amouse Bouche was inspired by Toulouse-Lautrec’s The Dunce’s Cap. When I first tried Amouse Bouche, my thoughts went straight to Kirsten Dunst as Marie Antoinette in a gilded boudoir surrounded by shoes and creamy pastel cakes. I smelled strawberry, and lots of it, but fine patisserie strawberry as light as angel’s breath sprinkled with powdered sugar. The next time I tried Amouse Bouche, I thought I’d sprayed the wrong fragrance and went digging through my sample bowl to look for the right vial. This time the strawberry was subtle, and fragrance was a puffy, diffuse jasmine, although still served on a sweet and tender butter crust. What was going on? The same kind of floral-gourmand magic that makes marvels like jasmine macarons and Isaphan cakes, that’s what. Cloud-like strawberry and buzzing jasmine married by pâte brisée is something Pierre Hermé should jump on right away. In the meantime, if you want a fragrance to go with your cheek-pink diaphanous ballgown, look no further. Imaginary Authors Cape Heartache Eau de Parfum is $85 for a 60 ml spray. For information on where to buy Imaginary Authors Cape Heartache, see Imaginary Authors under Perfume Houses. Dawn Spencer Hurwitz Amouse Bouche Eau de Parfum is $5 for a sample and $63 for a 10 ml spray. For the Extrait, a sample is $15, 5 ml in an antique-style bottle is $75, and 15 ml in an antique-style flacon is $185. For information on where to buy Amouse Bouche, see Dawn Spencer Hurwitz under Perfume Houses. Note: top image is Strawberries [cropped] by Sharon Mollerus at flickr; some rights reserved. I was surprised and happy to find the strawberry in these didn’t make them smell like Jolly Ranchera. As for men who have a weakness for redheads: bring them on. Do you know The Dunce’s Cap? I tried to look for an image online, but I couldn’t find one. Of course, I didn’t look super hard. Ack! Jolly Ranchers with a “s,” of course. I kind of liked the Ranchera! It’s funny, I have several books with posters and reproductions of the paintings of Toulouse Lautrec, and that one was not familiar. I notice the two painting links associated with the Amouse Bouche scent on other fragrance websites have been recently removed. I can’t find any “Dunce’s Cap” or even a similar looking hat among the 622 paintings, posters or sketches at the Collected Works website: http://www.toulouse-lautrec-foundation.org/. But T-L paintings often have two or more names associated with them, so it’s possible I’m missing it. If you look under Google Images, you can see the sketch that Cafleurebon originally had posted. It is not one of his more famous works — apparently DSH seems to have confirmed that because it was mentioned (no sketch shown) at the Non-Blonde just in the last few days — and I can’t find an image of the sketch anywhere else. Odd. I wonder what Toulouse-Lautrec would have thought of one of his sketches inspiring a fragrance? I think he would have approved, but might have preferred to have inspired a casserole. When I read the perfume copy, and the words “Dunce’s Cap,” what flashed through my mind was Watteau’s painting of Pierrot/Gilles–wrong century and not usually thought of as “funny,” but certainly enigmatic and arresting… and evocative of strawberries, brioche and woods…But your description of the fragrance does not seem to go with Watteau! I just took a quick peek at the Watteau image, and I could see Amouse Bouche fitting in! But I could also imagine something mossy and dark, too. Thanks for the excuse to look at art! Until now, really the only strawberry in perfume I’ve liked has been L’interdit. I guess it pays to keep an open mind. Angela, you had me a butch strawberry! I’ve been having a hard time typing straight today, too! I think it must be the weather. An interesting–and effective–concept, I thought! Amouse Bouche sounds absolutely scrumptious! I would love to try it but the price tag is kind of steep! Perfume is an expensive hobby, sadly! Maybe when strawberries are in season you can make yourself a strawberry tart and wear a good strong jasmine while you eat it to approximate Amouse Bouche. Cape Heartache sounds really good to me. I like those foresty scents. It would be perfect for winter I bet. The little touch of sweetness in it is nice, too. Interesting. Strawberry, it seems to me, is one of those scents/flavors that rarely resembles the actual fruit. I love the scent of true, ripe strawberries and detest pretty much everything strawberry-like with that sticky, fake frootness about it. However, the first of these in particular sounds like it avoids that entirely, and may be worth a sniff! Might convince me it can be done well. You, like me, might be spoiled by good strawberries, the kind that are good only for a day after they’re picked and simply can’t be shipped at all. I detest those styrofoam-like Driscoll strawberries and live for the tender, misshapen Hoods! Berry time has to be one of the best times of the year. It seems so far away right now! I love both of these, and I am very critical of strawberry in perfume since I love the real thing so much. These really work!